My intention this weekend was to get to a Gwardia Warszawa game, a team that I wrote about in January, unfortunately their match was called off due to the melting of Warsaw’s snow and the heavy rain that followed throughout the day on Friday. Searching frantically for a lower-league game to go to I discovered that my local team Drukarz Warszawa were playing at 11am Saturday morning. I resolved to forego my normal weekend lie-in to watch a bit of live football. Drukarz are the largest football club in Praga, the less financially developed right-bank of the Vistula river, which isn’t saying too much to be honest. Set up in 1926, as the club of the city’s printing presses, in the inter-war period the football team was relatively successful in the Warsaw area’s provincial leagues. Since the war the club has continued to flit about in the lower echelons of the Polish league pyramid. Not able to light up the reaches of the higher leagues, Drukarz has instead focused on its youth system bringing through the likes of future Polish internationals Marcin and Michał Żewłakow and Dariusz Dźwigała the current assistant coach of Jagiellonia Bialystok and father of Jaga defender Adam Dźwigała. Drukarz’s fortunes took a positive turn several years ago when its stadium was selected as a training base for Euro 2012 teams. In this regard Drukarz were lucky as their ground lies within five minutes walking distance of the brand new Polish national stadium. 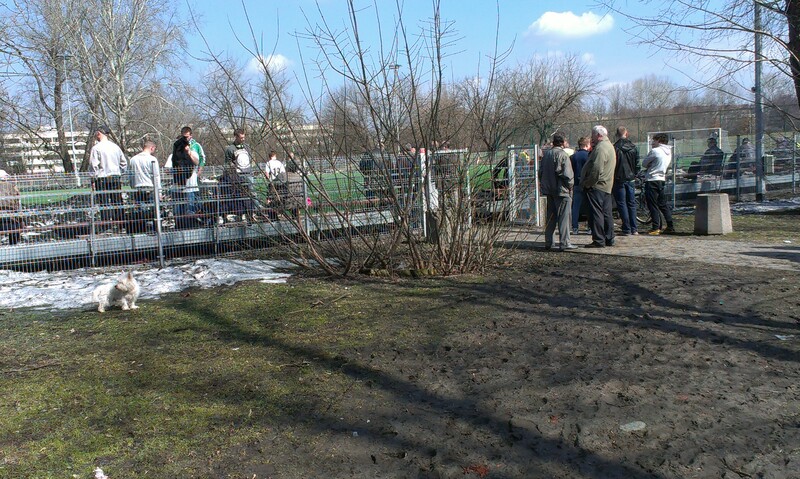 As a result the club received funds to renovate their ground and in 2011 were able to build a brand-new artificial pitch known ironically as the ‘Praga Wembley’. This season Drukarz are doing very well in the Warsaw Liga Okręgowa (6th tier) group one: before yesterday’s match they were top of the division with 36 points from 17 games and a +28 goal difference. Their opponents for the match were Wicher Kobyłka, themselves flying high in third place. With my head slightly fuzzy after a rather poor night’s sleep I set off to find Drukarz’s ground. Yesterday was the first proper spring day in Warsaw, the sun was shining brightly and even at 10am it was nice and warm. I got the tram to Park Skarzyszewski, a grand park close to Warsaw’s exclusive Saska Kępa neighbourhood, and very soon saw a small stream of people heading towards the Praga Wembley. As a result of the previous day’s downpour it turned out the match would take place on Drukarz’s artificial pitch. I had a walk around the perimeter of the ground and watched the two teams warming up. I then made my way to the main entrance and found myself a place to sit on the benches set out along the touchline. A crowd of perhaps 70 or so hardy souls were present to watch the game. These included the following types: A bunch of middle-aged men with moustaches, who chatted throughout the match about Drukarz, Legia, the Champions League and a mix of other football topics, about 15 or so Drukarz ‘Ultras’ who spent certain parts of the game belting out a selection of songs and several players’ wives and girlfriends. During the match we were joined by people walking dogs and a couple of other parents with their children who stopped by for a while only to later wander off. 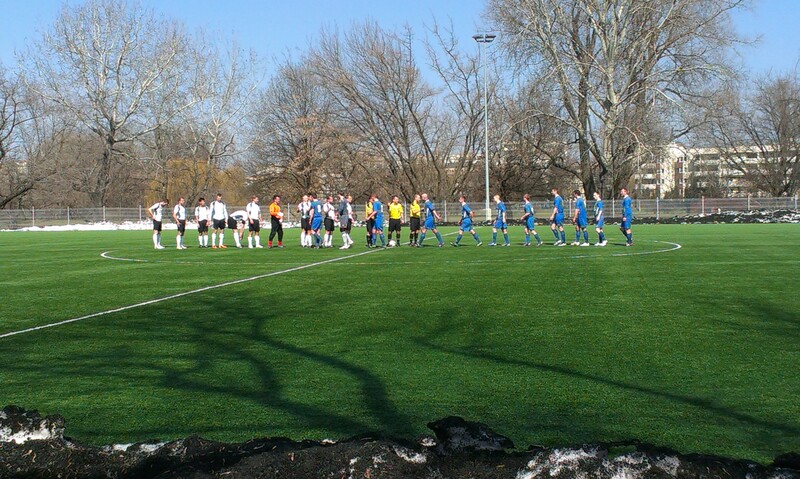 In terms of the match itself Drukarz started off in fine style. The referee granted a penalty to the home side after 10 minutes and their big number 9 put it away with aplomb. 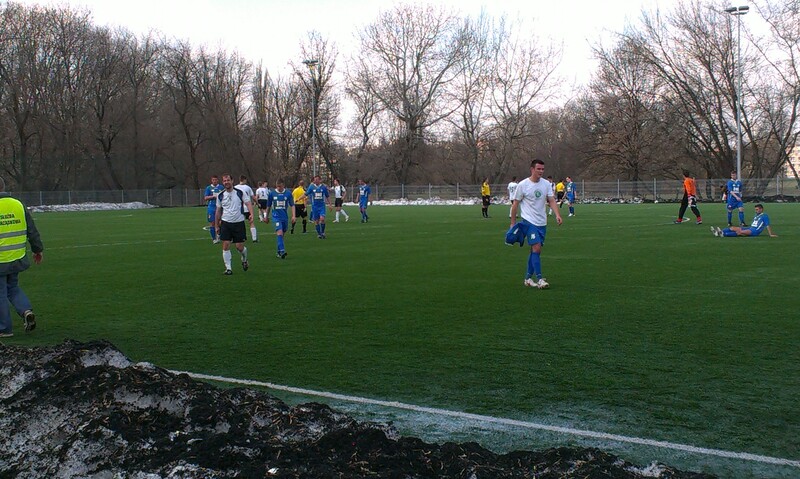 Drukarz were well on top and by half-time added another two more goals to make it 3-0. Wicher were not able to cope with the pace and physicality of Drukarz, something perhaps not surprising as Wicher’s last competitive match had been in early November! The second half started out a little more brightly for Wicher, who made it 3-1 early within 5 minutes of the restart. 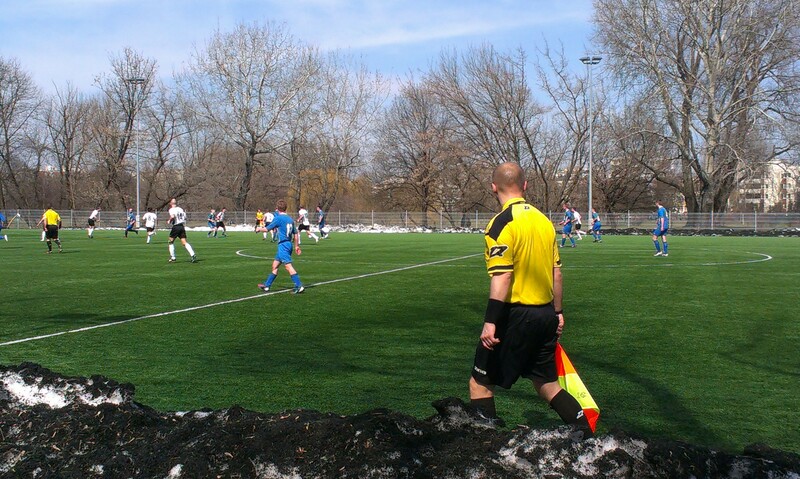 However Drukarz once more imposed themselves onto the match and scored another two decent goals. 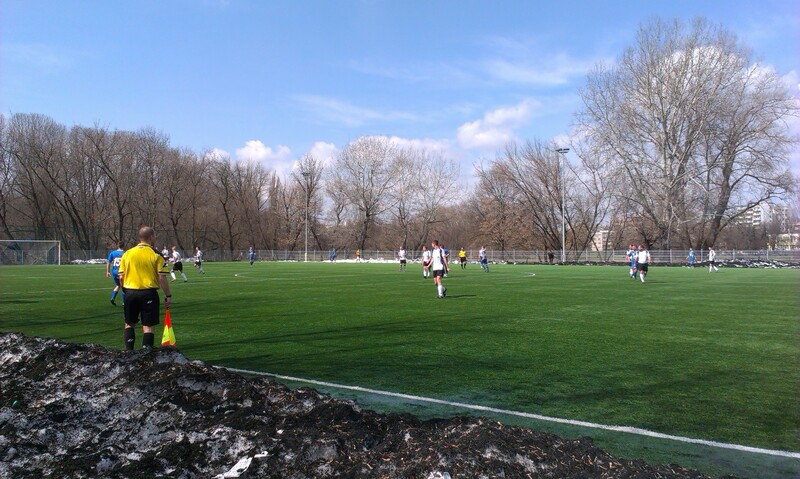 Drukarz had the match won, and although Wicher got a goal back to make it 5-2, Drukarz were not troubled further. So Drukarz cemented their position as leader of the division but with Wicher still having games in hand and PKS Radość and Dolcan Ząbki II also close behind, the end of the season should be interesting. As for my impressions I was pleasantly surprised with the standard of football on show and I really enjoyed sitting out in the sun for a couple of hours watching a game. I’ll definitely be back. DRUKARZ GOL! 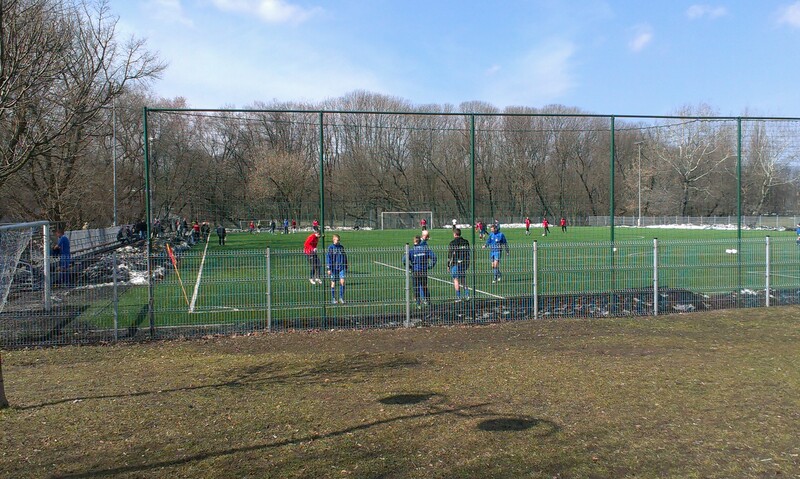 This entry was posted in Uncategorized and tagged Dariusz Dźwigała, Dolcan Ząbki, Drukarz Warszawa, Groundhopping Poland, Liga okręgowa, Marcin Żewłakow, Michał Żewłakow, PKS Radość, Polish football, Praga Wembley, Warsaw, Wicher Kobyłka. Bookmark the permalink.